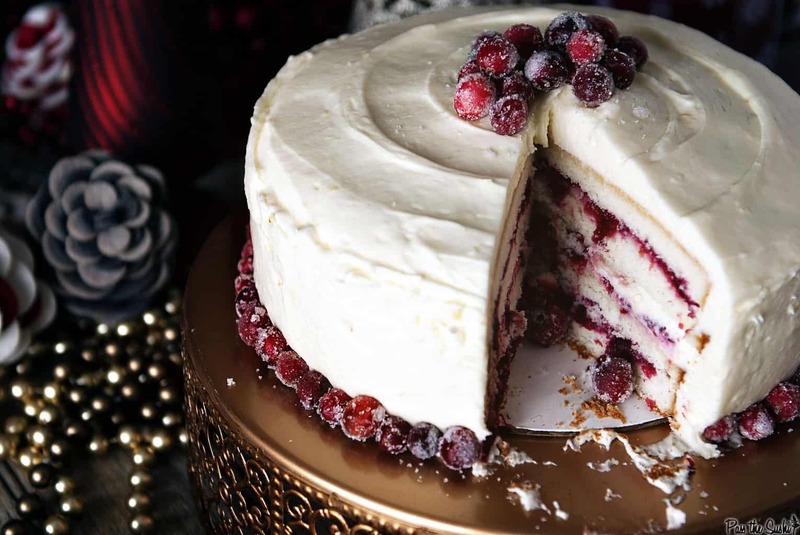 Cranberry Vanilla Bean Cake; Soft, decadent, and just a little bit tart. The perfect compliment to your holiday gathering. Throwing killer parties is work – but it’s also a blast and I love doing it. If it were up to me, every Friday night would be all about entertaining. But we all know that’s not realistic. When I do get to entertain large groups of friends and family, I always have a game plan, a keep it cool mantra, and roll off my shoulders attitude about everything. Once you do it a few times, it becomes a breeze and you’ll see just how easy throwing a killer holiday party can be. 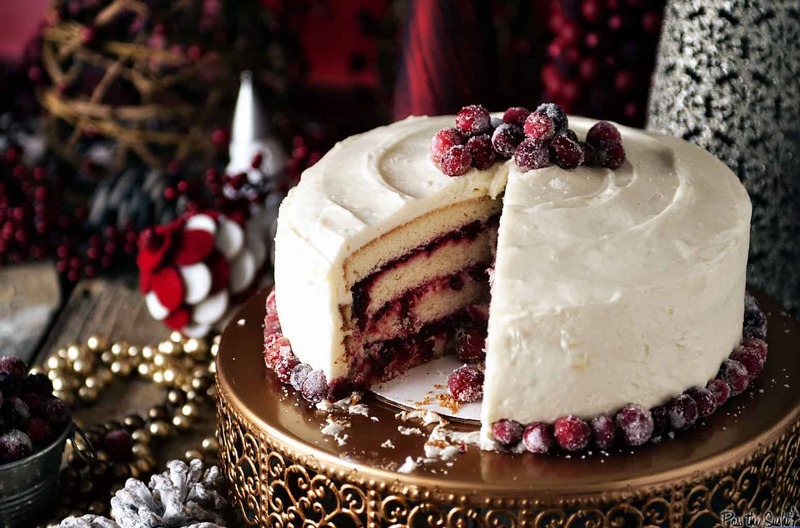 And, if you make this Cranberry Vanilla Bean Cake, you will be remembered as the host of all hosts. Yeah, it’s that good. 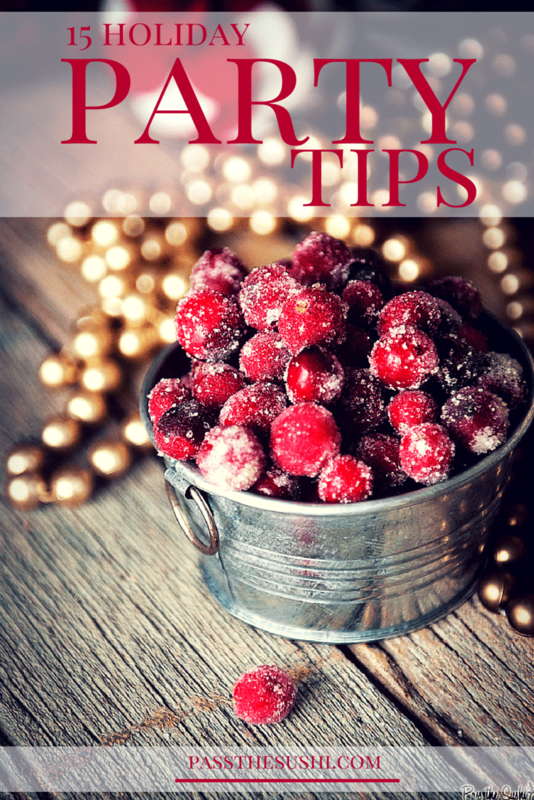 15 Holiday Party Tips to get you prepped and ready! Make a list – check it twice. Redundant, I know. But it really does help. From cleaning – room by room, to menu items, where I list out the ingredients, and finally to a drink list – it’s all written down. First, it makes shopping easier. It makes prep easier, and I know when I missed something or a step. Lists keep me rolling with the eye of the tiger. Blast some tunes and clean your home the day before, leaving only a quick sweep and bathroom check for right before guests arrive. Get a seriously good clean on those floors. Make the Pine-Sol mama proud. Vacuum. Dust everything. Change out the bathroom towels. An hour before guests arrive, take one last quick look around. All the works been dun, you may just have to pick up a stray dust bunny. If you miss sweeping the floors that one extra time, no one is going to notice. Get all Amy Atlas up in here. Bust out the fun fine china, use those gaudy crystal glasses. 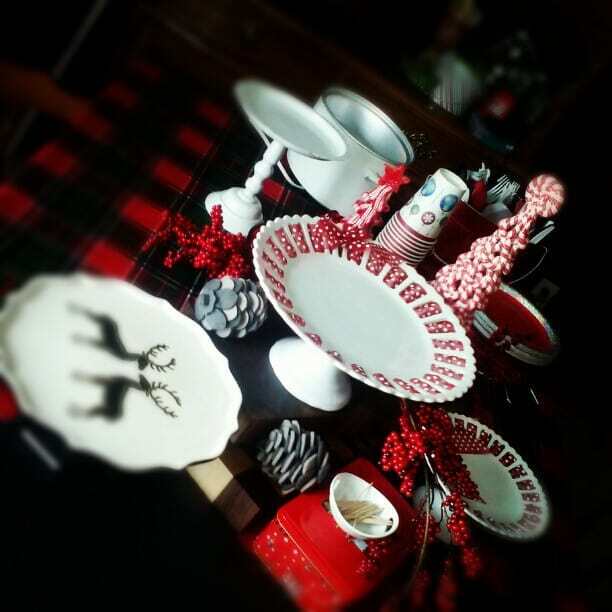 Have fun with your festive dinnerware. Pick a color scheme and stick with it. I happen to own a lot of red, so it’s my accent color for everything from plastic ware to napkins. This year instead of teaming the red dishes up with white, a couple bucks on some gold spray paint and recycled tins, and I’ve got myself a new color palette for under $5. Use cake plates to hold appetizers and snacks. Add volume, so that things are easy to reach by adding wooden boards and boxes below dishes. It doesn’t have to be expensive. Don’t buy new plates for this. Mix and match what you already own to create a fun inviting spread. Set the all the serving plates, dishes, and utensils out ahead of time. I always set my table the night before. One) So I know where everything is going and can just pop finished dishes in place a moment before guests arrive. Two) So that I can realize what I forgot and make that pesky last minute trip to the market… again. Buy some fun festive disposable utensils. There are so many out there right now that the boring white box of 400 forks can go away. Run to Target, or your local party store and pick up glittery forks and spoons, peppermint swirled straws, and cute napkins. It will help the clean up breeze by. Prep work is your friend. Anything that can be diced, minced, mixed or made ahead is. I use about 4 crock pots at any given party. All with dips, small appetizers or meatballs of sort. Everything is made the day before, placed in an airtight container and dropped in to heat a hour or two before the party starts. Play by Ina’s rules, don’t make every thing – No one expects you to! Sure, you may be the diva in the kitchen, but cooking for 30 is crazy if you want to enjoy yourself. Friends will offer to bring something, and let them. It takes some pressure off you – and you’ll get to enjoy something fresh and unexpected after a day in the kitchen prepping for this shindig. Purchase some pre-made snacks, cookies, appetizers or desserts to mix in along side your home made confections. No one will know the difference. Last year I made dessert dips, and paired them with fun purchased cookie varieties (animal crackers, biscotti bars, etc). Everyone thought they were great! Be mindful of your guests diets. I keep vegetarian dishes marked and away from non-vegetarian ones so that no one has to guess. Place serving spoons (and something to put it on) in front of everything so that nothing gets mixed accidentally. Prep the bar with a trash can for beer bottles and caps, plenty of glasses, ice and a big pitcher of sangria. Have coolers near by our right outside (to keep them cool in winter) stocked with beers and drinks. Don’t forget the ice. 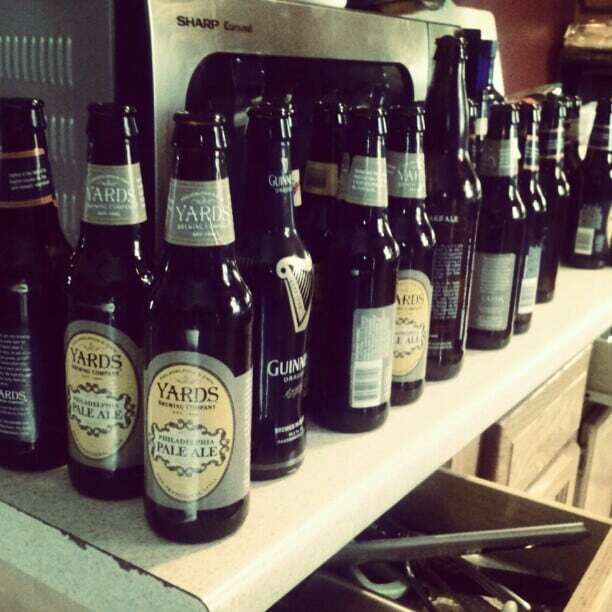 And keep in mind, that someone is going to be driving home, so have non-alcoholic options for them as well. Keep plenty of water bottles about too. You can never have enough. Small speakers with low music throughout the house. It keeps a soft subtle white noise so at an awkward pause or conversation lapse, no one notices. Mood lighting. Don’t use harsh day light bulbs, but rather, replace everything with softer lights – 25 watts. Use holiday lights to illuminate areas and set a fun tone. Candles – first, fire safety. Don’t leave an open flame near curtains or the tree. (I shouldn’t have to say this, but my neighbors house just burned down… wanna guess why?) I always light a few candles in the bathroom so that it’s easy to find. Should one guests flip off the lights, the next can easily find their way. And you know… candles smell pretty. Set some boundaries. Define what area’s are off limits. This is one of those hate to say it tips, but really it’s helps with my stress if I know guests aren’t poking in my bedroom. We have an entertaining area in the basement, is it for this party or not, decide ahead of time and make sure you stick to your guns. Closed doors and lights off means don’t enter to me. No kids is another boundary we have to set. Are you a bad friend for not wanting kids at your holiday cocktail party – no. Our house isn’t kid friendly, there are stairways without doors, sharp things, tools, and frankly, we don’t have toys so our stuff becomes playthings and that’s just not cool. Last time we had kids over my toothbrush was in the toilet (oh, hide that somewhere too). How? Why? It doesn’t matter…. I love my friends kids, but at our parties, we include in the invitation, no children please. Most of all – enjoy yourself. Friends don’t care about picture perfect tables, fancy food, or creative cocktails. They will enjoy themselves with a bag of Cheetos and some High Life if it’s what’s on tap. It’s about the company and conversation. So after you’ve handed out the first round of drinks, settle in and spend some time with your guests, not serving them. 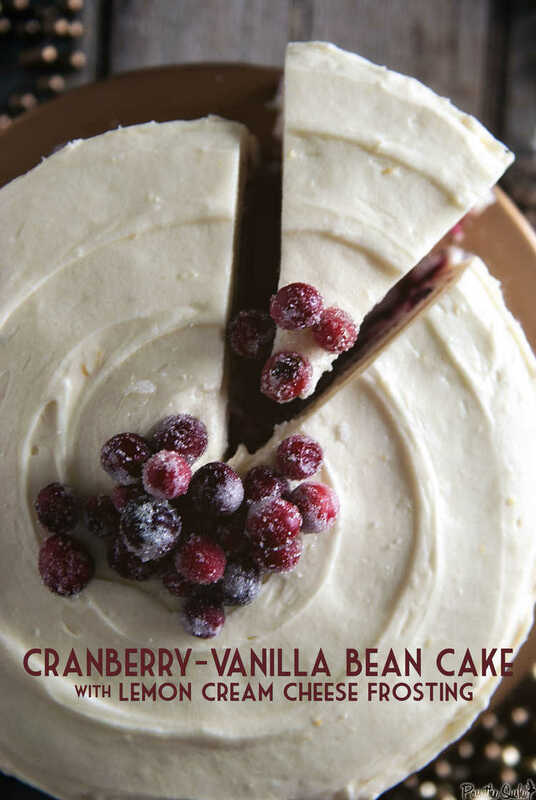 Ready to make a Cranberry Vanilla Bean Cake? If you’ve tried my Cranberry Vanilla Bean Cake recipe, or any other recipe on passthesushi.com please don’t forget to rate the recipe and let me know where you found it in the comments below, I love hearing from you! You can also follow along for more good eats and travel tips on Instagram @passthesushi & @girlcarnivore, Twitter & Facebook. If you are looking for another pull out all the stops cake, go no further. In a small saucepan, combine the cranberries, sugar, orange zest, juice, cinnamon, ginger, and cloves. Bring to a boil over, then reduce and simmer for 10 minutes, or until cranberries pop. Remove from heat and mash cranberries with a wooden spoon. Allow to cool completely. In a bowl, combine the beaten egg whites and buttermilk. Using a sharp knife, carefully scrape seeds from the inside of the vanilla beans and stir them into the buttermilk mixture. Allow to stand at room temperature for 30 minutes. Prep two 9" cake pans by greasing and flouring. Knock out any excess flour. Set aside. Whisk together the flour, sugar, baking powder, and salt together in a large bowl and set aside. In the bowl of your stand mixer, fitted with the paddle attachment, cream the butter for 30 seconds on medium high. Scraping down the sides as needed, gradually add the flour mix. Add half of the buttermilk and mix to combine. Add the remaining buttermilk and beat on medium speed for 2 minutes, pausing to scrape down the sides as needed. Divide batter evenly into the cake pans and bake for 25 to 30 minutes, until a toothpick comes out clean and edges are light golden. Cool for 10 minutes on a wire rack before removing cakes from pans to cool completely. Combine the cream cheese and butter in the mixing bowl of your stand mixer and beat on medium speed until light and fluffy. Add the lemon zest and juice and mix again. Scrape down the sides and add in the confectioners’ sugar, 1/2 cup at a time until combined. Add a tablespoon of milk if the mixture is too thick. Cut the cakes in half evenly to make 4 total cake layers. Place one cake layer bottom side down in the center of your serving platter and spoon 1/3 cup cranberry sauce evenly over the top. Place a cake layer on top of that and spread 1/2 cup lemon frosting evenly over it. Top with a thin layer of cranberry sauce, about 1/3 cup. Top with the next cake layer and spoon 1/3 cup cranberry over top. Finally top with the last cake layer, cut side down. Crumb coat your cake and place in fridge for 10 minutes to set. Finish off with a healthy layer of frosting and top with sugared cranberries before serving, if desired. Oh man, yes, I love parties, but I hate all the work for them. Such a great tip list. And this CAKE!!! Um, I won’t be sharing this with my party guests. This is just for me! I can’t wait to try this cake. It’s beautiful and I like the ingredients. Great tips, too, Kita. Can we talk about how beautiful your photography is??! This is gorgeous!! And I LOVE the flavors..and the photos..just perfect! I’m crushing on this cake – anything that involves cranberries and lemon zest – sings to me! Great tips too! My poor cats don’t like me when I’m in ‘company-coming’ cleaning mode…I follow them around with the lint remover like a deranged neat freak. This cake! It looks sooo good! I made one similar using cake mix (*hangs head in shame*). First of all, this cake is GORGEOUS. Second, I love and agree with all of your tips. I usually have a billion different lists before any party and it makes everything so much more organized! What a great list, but an even more amazing cake!! I’m droolimg!! Freaking gorgeous!! This is a Christmas cake for sure and those sugared cranberries? Yes! Fabulous holiday cake! And I love your party tips. Many people are so afraid to give a party so hopefully these will convince them that it just ain’t that tough! Dang girl! You can make some amazing looking food, and take great photos! This looks amazing – Definitely on my to-try list! Kita, this cake is gorgeous! That cake is gorgeous! And I agree, I wish I could host dinner parties all the time, I love making full meals but rarely get to do it, since I am usually cooking for one. Let’s be neighbors and take turns hosting haha. Please help! I really want to make this recipe this weekend, but am a little confused by the directions…. Under “make the cake”, 3rd paragraph, it says to “In the bowl of your stand mixer, fitted with the paddle attachment, cream for 30 seconds on medium high.” What am I creaming? What should be in the bowl at this time? Am I creaming the original portion of the cake mix that has been sitting for 30 min (beaten egg whites, buttermilk & vanilla bean)? I usually don’t do homemade cakes…. so this is probably something most would know without asking! Would love some directions for dummies 🙂 Thanks so much! Hi Angela, sorry for the confusion, I need to edit this post ><. It is indeed only one 3/4 cup butter for the cake, then an additional 3/4 cup for the icing.. Cream the butter in your blended while making the cake, then later tackle that frosting. This is a huge project to take on if you haven't baked cakes before and id love for you to post a pic on facebook when your masterpiece is ready! about the 3/4 cup butter, I use 3/4 cup to make the frosting, but what to do with the other 3/4 cup butter, do I use it to make the cake? I find it very confusing, Rita. The first 3/4 cup is creamed and used for the cake recipe, while the second is used for the frosting. I added some notes to the recipe to hopefully help 🙂 Thank you!! I hope your cake is wonderful. I tried to bake the cake but I think something went wrong. My cake is 2 cm. thick in the middle and almost 1 cm. on the edge. Tell me is this o.k.? I am dutch and I am sorry for grammatical error. Rita. One more question… 3/4 cup butter, softened is on the ingredient list twice, but I only see where to use it once in the directions. Should it be there twice? If so, where do I use the 2nd portion? Again, thanks!! 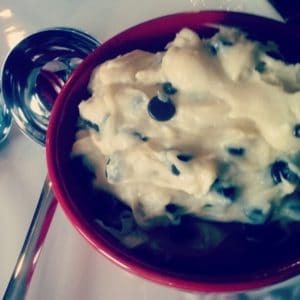 I just tried this recipe in 2019 – I have to say this was a total flop. I am an experienced baker and haven’t seen a recipe that has you sift the sugar in with the flour. My cake fell in the middle, which has basically made it unusable. Just wanted to give a warning to anyone looking to actually try this and not just comment on how pretty it is.